This is located opposite to the barn and has the basic facilities for storing food and drink. It has 3 sinks and 2 cookers with plenty of work areas. There is hot water and a large fridge. Ideal for storing prepared food, washing up facilities and offers the basic facility of knocking up a fried breakfast in the morning. Strongly recommended to use for the weekend. We can now offer 2 Bell Tents to hire for for your event! Hire of our large heavy duty 4 metre Bell tent includes 1 inflatable double mattress. This tent can comfortably sleep 4 adults. Waterproof ground sheet and the option of rolling up the sides if the weather is too hot. Solar power LED lighting light up both the outside and inside of the tent. This would be set up for you and is a great opportunity for you or your guests to easily stay on site for the duration of the event. You do not need to find and bring your own tent, any hassle setting it up or even taking it down! The outside lighting is really handy when finding your way back to the tent at night! A small soft play area for small children is available. This is located in the wagon room if required. This area is padded and consists of a ball pit and slide. Children must be supervised. 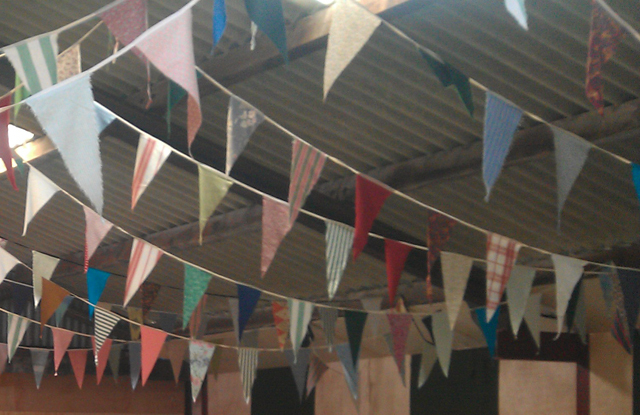 We can provide homemade bunting for you to use to decorate the barn. The bunting is high quality and improves the overall 'feel' of the barn. Extras that are currently provided externally by a third party. Please click on the website link next to the description and another window will open. Some people have their wedding and then plan to have the reception at the farm as we are not licensed to conduct official wedding ceremonies. However if you want to you could have a ceremony conducted as part of your weekend as an extra celebration for all of your guests! If this interests you click below on the link to find out more information.